03 Jan 2016 - The final race of the Christmas Week of Cyclo-Cross, as well as the final race of the Kansas Cyclo-Cross Season, as well as the final race of the 6-race Series60CX points series, was held in frozen/thawing conditions at Herman Laird Park in Shawnee, KS. Lots of slipping and sliding on ice, snow, mud, and even some grass made this race memorable. Osceola Velo Club's Conner Rainey fought back to finish 2nd in Junior Men, Pete Williams finished 8th, one place ahead of Conner R., in Men's Cat 4, and Pat Schlager finished 4th in Single-Speed. These results secured each racer's overall position in the Series60CX points series with Conner finishing 1st in Junior Men (by 1 point!) & 1st in Men's Cat 4, Pat S. finished 2nd in Single-Speed, and Pete W. finished 3rd in Men's Cat 4. Great season, Team! Check out some photos of the race as well as the overall Series60CX podiums. 31 Dec 2015 - The Christmas Week of Cyclo-Cross continued with the 'Cross Off the Old Year cyclo-cross race held at Herman Laird Park in Shawnee, KS. With temperatures reaching just above freezing, the recent blanket of snow quickly thawed along the racing line, making each lap of each race more muddy and more sloppy. Osceola Velo Club's Conner Rainey finished 7th in Junior Men & 5th in Men's Cat 4, Pete Williams finished 6th in Men's Cat 4, and Pat Schlager finished 9th in Single-Speed. Check out some photos from Shawnee. 26 Dec 2015 - The Christmas Week of Cyclo-Cross kicked off with the Boxing Day Cyclo-Cross race in Leawood, KS. Chilly, humid, and cloudy conditions greeted Kansas cyclo-cross racers after a nearly three-week layoff on a course which featured long, grassy straights and a single-track section through the trees. Osceola Velo Club's Conner Rainey finished 3rd in Junior Men & 7th in Men's Cat 4, Pete Williams 12th in Men's Cat 4, and Pat Schlager 6th in Single-Speed. Check out some photos from Leawood. 13 Dec 2015 - Osceola Velo Club's Pat Schlager drove on over to Columbia, MO for the Missouri State Cyclo-Cross Championships which were held in true 'cross conditions -- chilly, wet, progressively muddy, standing water. Pat S. managed to stay upright on the challenging course to finish 23rd in Men's Cat 4/5 (and yes, Pat was on his single-speed like always). Check out a couple of photos of Pat playing in the mud in Missouri. 06 Dec 2015 - The Kansas Cyclo-Cross Season resumed after the Thanksgiving Holiday break with the Fast & Furriest Cyclo-Cross race held at the Humane Society of Greater Kansas City on a very "heavy" course. Osceola Velo Club's Conner Rainey fared very well with a win in the Junior Men's race and a second place in the Men's Cat 4 race! 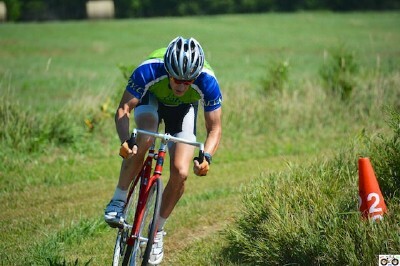 Pat Schlager finished 7th in Single-Speed, while Pete Williams was 7th in Men's Cat 4. Check out some photos. 22 Nov 2015 - Two more podiums for Osceola Velo Club at the Cliff Drive Cyclo-Cross weekend held at Kessler Park in Kansas City, MO on a couple of tough courses in early winter conditions. Conner Rainey 2nd in Junior Men on Day 1 and Pat Schlager 3rd in Single-Speed on Day 2. Conner R. also finished 7th in Men's Cat 3/4 on Day 1, and 4th in Junior Men & 9th in Men's Cat 3/4 on Day 2. Pat S. also finished 5th in Single-Speed on Day 1. Check out some photos from Cliff Drive. 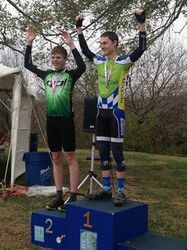 15 Nov 2015 - Two podiums for Osceola Velo Club at the 2015 Kansas State Cyclo-Cross Championships held at Centennial Park in Lawrence, KS. Conner Rainey is the new State Champion in Junior Men 17-18, and Hunter Adams won Silver in Men's Cat 3! Pat Schlager finished 7th in Single-Speed, Conner R. 13th in Men's Cat 4/5, Pete Williams 36th in Men's Cat 4/5, and Ian Pepin 40th in Men's Cat 4/5. Check out some photos from Centennial Park. 08 Nov 2015 - Another full weekend of racing for Osceola Velo Club, this time in Topeka and Leavenworth, KS. Saturday's Capital Cup was held at a new location featuring lots of bumpy grass and sweeping corners. Conner Rainey finished 3rd in Junior Men & 4th in Men's Cat 4, Hunter Adams 3rd in Men's Cat 3, Pat Schlager 6th in Single-Speed, and Pete Williams 7th in Men's Cat 4. Sunday's Veterans' 'Cross was once again held at the VA Facilities featuring grass, gravel, and a hint of mud. Conner R. finished 1st in Junior Men & 9th in Men's Cat 4, 7th for Pat S. in Single-Speed, and 16th for Pete W. in Men's Cat 4. Check out some photos from Topeka and some photos from Leavenworth. 01 Nov 2015 - A full weekend of racing for Osceola Velo Club over at Herman Laird Park in Shawnee, KS with the Halloween Cyclo-Cross (a.k.a. Colavita Cup) Saturday and the Boulevard Cup Sunday. Overcast with chilly temperatures and overnight showers made Saturday's race rather 'cross-like with a lot of squishy mud to negotiate, while the sun returned with unseasonable warm temperatures Sunday. Saturday's results: 4th in Junior Men & 17th in Men's Cat 4/5 for Conner Rainey, 29th for Pete Willians in Men's Cat 4/5, 4th for Hunter Adams (in costume) in Single-Speed, and 11th for Pat Schlager (in costume) in Single-Speed. Sunday's results: 4th in Junior Men & 6th in Men's Cat 4 For Conner R., 2nd for Hunter A. in Fatbike Category, 9th for Pat S. in Single-Speed, and 18th for Pete W. in Men's Cat 4. Check out some photos from Saturday's race and some photos from Sunday's. 25 Oct 2015 - A good, full day of racing for Osceola Velo Club at the SMP CX race at Shawnee Mission Park in Shawnee, KS. Conner Rainey 2nd Junior Men & 13th Men's Cat 4/5, Pete Williams 27th Men's Cat 4/5, Pat Schlager 8th Single-Speed, and Hunter Adams 11th Men's Cat 3/4 & 17th Men's Cat1/2/3. Check out some photos from Shawnee Mission Park. 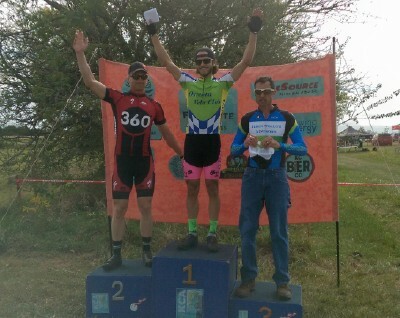 18 Oct 2015 - 3 podiums in two days for Osceola Velo Club at the Joules 'Cross weekend held just outside Lawrence, KS. Conner Rainey 3rd in Junior Men Saturday, Hunter Adams 1st Saturday and 2nd Sunday in Men's Cat 4. Additionally, Conner R. finished 14th Saturday in Men's Cat 4, 4th in Junior Men and 16th in Men's Cat 4 Sunday; Pete Williams finished 21st Saturday and 13th Sunday in Men's Cat 4; Hunter A. finished 5th in Single-Speed Sunday; while Pat Schlager finished 8th Saturday and 7th Sunday in Single-Speed. That's a lot of racing and some nice results, Team. Check out some photos of Osceola Velo Club at Joules 'Cross. 11 Oct 2015 - Another fun day of cyclo-cross racing for Osceola Velo Club, this time over in St. Joseph, MO at the Robidoux Roundup CX. The callenging course included two unique obstacles per lap -- a broken-up stone staircase through a stone tunnel and an insanely steep and long dirt run-up. Conner Rainey finished 9th in Men's Cat 4/5, Pete Williams 15th Men's Cat 4/5, Conner R. doubled up with a 1st in Junior Men, and Pat Schlager finished 2nd in Single-Speed. Check out the photos. 27 Sep 2015 - Great fun was had by one and all at the Cyclo-Cross at Raytown BMX cyclo-cross races this weekend. Two days of racing on, near, and around the Raytown BMX track and facility in Raytown, MO. Osceola Velo Club had three racers out there each day with Pat Schlager finishing 9th Saturday and 9th Sunday in Single-Speed, Conner Rainey finishing 10th and 14th in Men's Cat 4, and Pete Williams finishing 15th and 19th also in Men's Cat 4. Pat S. and Conner R. continue to rack up the KBCXR points in their respective categories with Pete W. scoring his first KBCXR points on Saturday. Check out the photos. 20 Sep 2015 - First race of the 2015 Kansas Cyclo-Cross Season (and first race of the 2015 KBCXR (Kansas Best Cyclo-Cross Rider) points series) over in Leavenworth, KS at the Buffalo Bill Cyclo-Cross Race. Osceola Velo Club was well represented with Ian Pepin finishing 14th in Men's Cat 5, Pat Schlager finishing 8th in Single-Speed, Conner Rainey finishing 10th in Men's Cat 4, and first-timer Pete Williams finishing 21st in Men's Cat 4. Only a handful of KBCXR points scored, but still, good racing, Team. Check out the photos. 27 Aug 2015 - Osceola Velo Club's Conner Rainey was back out at the Penrose Park Velodrome in St. Louis, MO for the final races of the Thursday evenings' Mr. Bumpy Face Track Racing Training Series. Despite being on a borrowed bike without the optimal gearing, Conner R. finished 4th in the Split Scratch Race and 6th in the Flying Kilo. Nice racing, Conner. Check out the photos of Conner on "Mr. Bumpy Face." 02 Aug 2015 - Super successful day for Osceola Velo Club at the 2015 Kansas State Track Championships held at the Lawrence Grass Velodrome. Pat Schlager is the new State Champion in the Men's 55-59 500 Meter Individual Time Trial, while Pete Williams is the new State Champion in the Men's 55-59 Scratch Race! Pete W. also won Bronze in the Men's 55-59 500 Meter Individual Time Trial, and Pat S. won Silver in the Men's 55-59 Scratch Race. That's some great velodroming, team! Check out the photos of Pat and Pete on the Lawrence Grass Velodrome. 30 May 2015 - Osceola Velo Club's Pat Schlager drove on over to St. Louis, MO for the Missouri State Timed Track Championships held at the Penrose Park Velodrome. Pat S. competed in the 500 Meter Individual Time Trial and "The Kilo" (1000 Meter Individual Time Trial) before the rains hit. Pat's times were a little off from last year's, but he finished 5th in the 500M in the Masters' Category and 9th in The Kilo in the Open Category. The remaining timed events are to be rescheduled for a later date. 08 Feb 2015 - The dates have been set, so mark your calendars for Coach Pat's Sprint Training Clinics presented by Osceola Velo Club. Area racers will have three opportunities, 16 & 30 Apr and 14 May 2015, to learn the finer points of sprinting from none other than Osceola Velo Club's USA Cycling Licensed and KCA Hall of Fame Cycling Coach, Pat "Coach Pat" Schlager. Check out USA Cycling's KS Event Page for additional information, including a link to the event flyer. See you at the clinics. 25 Jan 2015 - Big night for Osceola Velo Club at the 2014 Kansas Cycling Association (KCA) Annual Awards Banquet. Ian Pepin 1st in Kansas Best Cyclo-Cross Rider (KBCXR) for Junior Men; Conner Rainey 2nd in KBCXR for Men's Cat 4; and Pat "Coach Pat" Schlager was inducted into the KCA Hall of Fame for his contributions to Kansas cycling as a cycling coach. Here are a couple of photos of the awards banquet.